Technology @ Your Figertips describes a process for getting the best possible technology solution for your organization. In this book you will find the steps you should take to identify your technology needs, consider your options, acquire the technology, and implement a technology solution that will serve you today and provide a foundation for your organizations technology in the future. Paper copies are available by calling the Department's publications distribution center, EDPubs, at: 1-877-4EDPubs (1-877-433-7827). 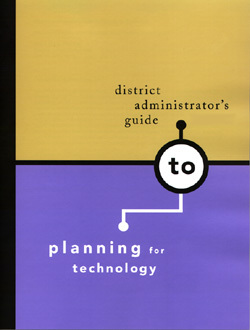 The purpose of the District Administrator's Guide to Planning for Technology is to share the lessons learned from the Leaders Online project, and to help school districts examine their administrative processes so they can best determine ways to use computer networks as a tool to improve those processes. Districts that have already started implementing computer networks can use this guide to reflect on their progress so far and may find additional ideas. The Technical Guidebook for Schools offers detailed instructions on network planning, network elements, potential uses for your network, and sample network implementations. This guide pulls the knowledge of over 50 individuals from 25 high-tech companies to develop technical guidelines for schools. This guidebook seeks to make that information available to schools in Silicon Valley and beyond. The purpose of the Very Basic Network Construction Set is to provide you with the knowledge to analyze and understand almost any modern computer network. It will also give you a firm foundation to begin learning how to plan your own school network. The information provided is not enough that you could plan your school network yourself without more training, but enough so that you can watch over and understand the activities of your network provider or consultant. kids.net.au - the search engine just for kids.